It looks absolutely to die for. How lucky for them that you delivered breakfast to them-a gesture I am sure they will remember fondly. 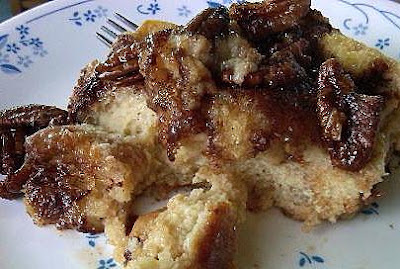 Pecans and Pralines are my favorite and when I saw Dana tweet about it I commented on how I love the combo but never knew it was made for French Toast. My wife Monika would never make it so I could only dream about having it. Well, when Dana showed up at our campsite with this huge dish I was totally surprised and was thankful of her gesture. This was a treat that I will never forget as it tastes so yummy and smells delicous when cooking. She did such a great job and made so much that left overs were just as good as the day it was first made. Thank you so much Dana a treat indeed.